Kingdom of Italy when it was formed. 3.2.1 Accusative "te" for "tu" 3.2.2 Double dative pronoun 3.2.3 Masculine definite articles 3.2.4 Noi + impersonal si 3.2.5 Fo (faccio) and vo (vado) 3.2.6 Loss of infinitival "-re"
Languages of Italy by groups (Tuscan dialect group in light azure). Livorno and the vicinity, and along the southern coast as far as the city of Piombino. 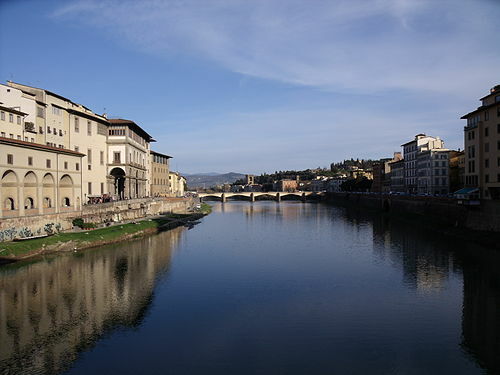 Arezzo and the Valdichiana. Senese, spoken in the city and province of Siena. Grossetano, spoken in the city and province of Grosseto. Corsican on the island of Corsica, and the Corso-Sardinian transitional varieties spoken in northern Sardinia, are classified by scholars as a direct offshoot from medieval Tuscan. Tuscan dialect is the use of the accusative pronoun te in emphatic clauses of the type "You! What are you doing here?". Standard Italian: tu lo farai, no? 'You'll do it, won't you?' Tuscan: Te lo farai, no? Standard Italian: tu, vieni qua! 'You', come here!' Tuscan: Te, vieni qua! 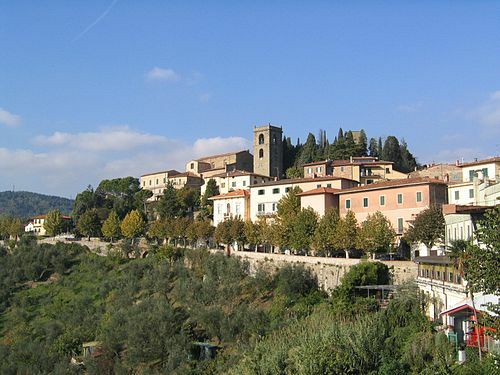 Tuscany is the personal use of the particle identical to impersonal si (not to be confused with passive si or the reflexive si), as the first person plural. It is basically the same as the use of on in French. It's possible to use the construction si + Third person in singular, which can be preceded by the first plural person pronoun noi. Italian: Abbiamo mangiato al ristorante. Tuscan: S'è mangiato al ristorante. Italian: Siamo andati al cinema. Tuscan: S'è andati al cinema. Tuscan dialect is what might appear to be shortening of first singular verb forms in the present tense of fare (to do, to make) and andare (to go). These forms have two origins. Natural phonological change alone can account for loss of /d/ and reduction of /ao/ to /o/ in the case of /vado/ > */vao/ > /vo/. A case such as Latin: sapio > Italian so (I know), however, admits no such phonological account: the expected outcome of /sapio/ would be */sappjo/, with a normal lengthening of the consonant preceding yod. What seems to have taken place is a realignment of the paradigm in accordance with the statistically minor but highly frequent paradigms of dare (give) and stare (be, stay). Thus so, sai, sa, sanno (all singulars and 3rd personal plural of 'know') come to fit the template of do, dai, dà, danno ('give'), sto, stai, sta, stanno ('be, stay'), and fo, fai, fa, fanno ('make, do') follows the same pattern. The form vo, while quite possibly a natural phonological development, seems to have been reinforced by analogy in this case. Loss of infinitival "-re"  A phonological phenomenon that might appear to be a morphological one is the loss of the infinitival ending -re of verbs. Italy by Padova University Archived May 6, 2008, at the Wayback Machine. 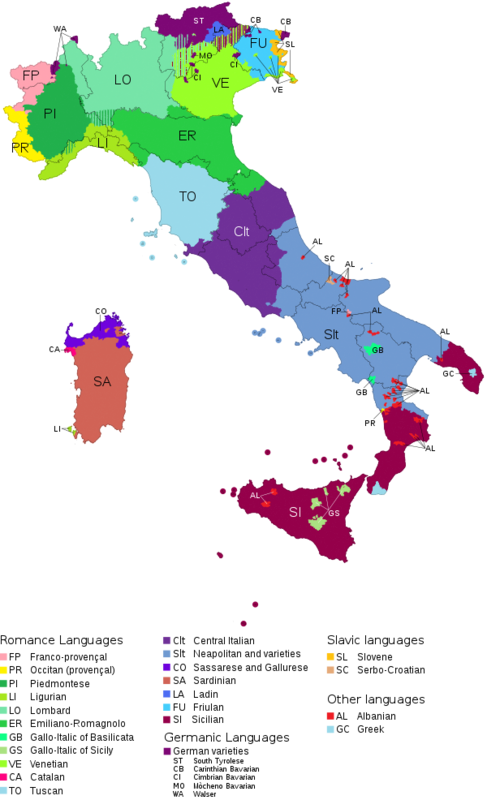 ^ "Italian dialects by Pellegrini". Italica.rai.it. Retrieved 2013-11-22. ^ AIS, Sprach- und Sachatlas Italiens und der Südschweiz, Zofingen 1928-1940 ^ Harris, Martin; Vincent, Nigel (1997). 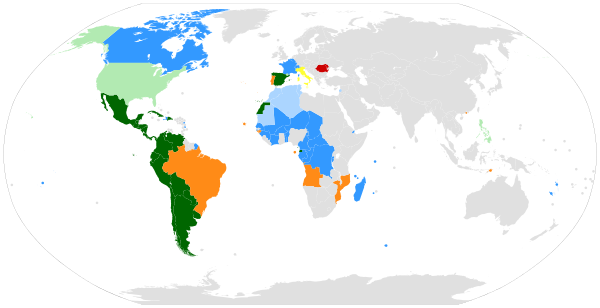 Romance Languages. London: Routlegde. ISBN 0-415-16417-6. Giannelli, Luciano. 2000. Toscana. Profilo dei dialetti, 9. Pisa: Pacini.